I love burgers. Veggie, of course. I love how they can be so filling and hearty yet be full of such goodness. When I’m trying to shift some pounds, I know a good homemade burger is a good choice to ensure I don’t feel deprived as they pack comfort, flavour and are incredibly filling for surprisingly few calories. These burgers come in at just 118 calories each for 6, or 175 for 4 chunkier burgers. The creamy sauce here gets its richness from roasted red peppers and good olive oil and its creaminess from bread. It’s a great alternative to cholesterol laden mayonnaise with just 124 calories per serving and no cholesterol. Both of these recipes come together in a flash using a food processor. They are incredibly quick and easy. For the burgers, serves 4-6. Adjust seasonings and spices to your liking. Simply whizz all of the ingredients together in a food processor until blended, taste and adjust seasonings. Put in a bowl and leave to sit in the fridge for an hour or more to firm up. Divide into 4 or 6 and make burger shapes. Fry in cooking spray for a few minutes on each side until golden. Serve with salad and pepper sauce. For the Creamy Roasted Red Pepper Sauce, enough for 8. Soak the bread in water, then wring it out. Add the soaked bread and drained peppers to a food processor followed by the garlic. With the motor running, gradually add the oil, pouring it in slowly through the feed tube. When the mixture is a thick cream, stir in the lemon juice. This entry was posted in Bread, Egg-free, Mains, salads, vegan, Vegetarian and tagged burger, dairy free, egg-free, healthy, healthy recipes, low calorie, low fat, quick meals, vegan, vegetarian. Bookmark the permalink. Looks delicious! Thanks for your visit! I really like the color of this burger. I imagine it is delicious! They do come out a gorgeous colour, its amazing the strength of beetroot juice! That looks amazing!! I love the colour! hey 😉 thanks for stopping by and the star. These look delicious! I need to try it with juice pulp! Looks delicious. Do you think peanut butter would be too strong of a flavor in this recipe? Also, I wonder if I could substitute barley or rice for the bulgur wheat. These look great. I’m a big fan of beetroot in all it’s forms. I’ve never tried beet burgers though. The vibrant color alone makes me want to try these! Love Beets!!!! Oh….I’m inspired again!!! A couple of months ago I was part of a “Beet Challenge” to make Beets 5 different ways! I’ll be posting that shortly so be on the lookout!! Yesterday I reviewed the cookbook, Color Me Vegan. Although I loved it overall, I was disappointed that many of the recipes used extracted oil which I rarely use anymore. If you’re curious why, check out this link: http://engine2diet.com/the-daily-beet/the-big-oil-post-plus-a-giveaway/. 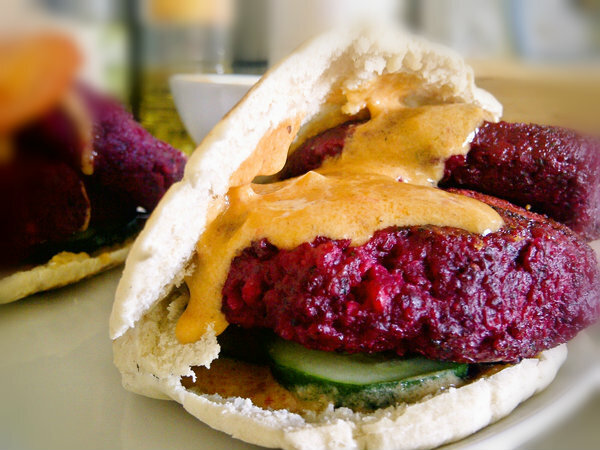 In my review, I mentioned that that I was let down because I wanted to try the Beet Burger recipe, but opted not to because it used ¼ cup of oil. 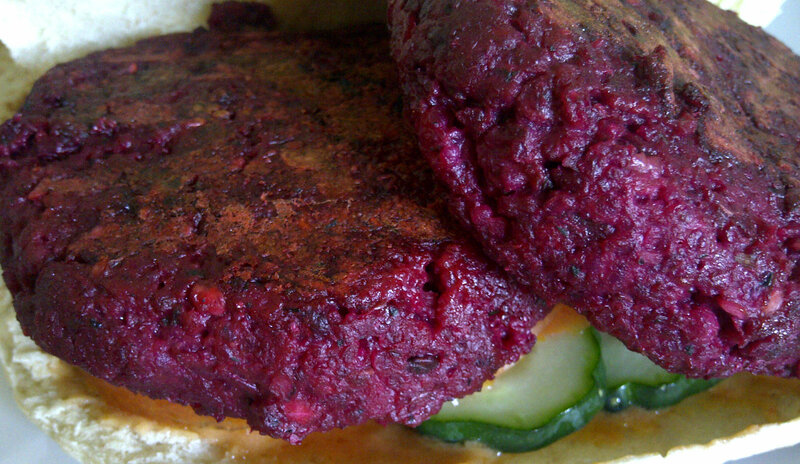 In a comment on the post, however; Poppy shared a link to her oil-free Lentil and Beetroot Burger recipe. I checked out the link, and the burgers looked absolutely delicious! And since they’re also the prettiest burgers I’ve ever seen I wanted to share the recipe. I’m planning on making them tonight. Thanks Poppy! Pingback: Places I Forking Love; Manly, Australia | Fork You! Looks & sounds awesome – Can’t wait to try this recipe! yum i so want to try this!! How good do they look??? What a fabulous colour! So creative! Perfect for a new year celebration, Poppy. Thank you Shanna! Happy New Year! Looks fantastic!! Love the colors! 😉 Wish you a wonderful New Year!! Yum – these just look stunning – so vibrant! Wishing you a wonderful New Year! The colour is so captivating – looks great! Thanks for visiting! Thank you, I love the colour too! Can you tell me if the beetroot is raw or cooked when you grate it. I make them with raw beetroot but you could use cooked also.